Believe it or not, you’ve still got a little bit of time to get a project done. I suggest making something small and simple, knit with super bulky yarn, and your last minute gift’s in the bag! Keep it simple silly! Hats are fast & easy last minute gifts, and this one is almost brainless – no purling! Headbands are fast & easy, and always well received (especially by people with big hair). A neckwarmer is a perfect gift for men and women, in a cold climate everyone can use one – and on those blustery days that you do need one, they’ll be thanking you! This entry was posted in Cascade Spuntaneous, Free Patterns, freebies, hat, hats, Malabrigo Rasta, neckwarmer, Uncategorized on December 20, 2017 by Knit-O-Matic. 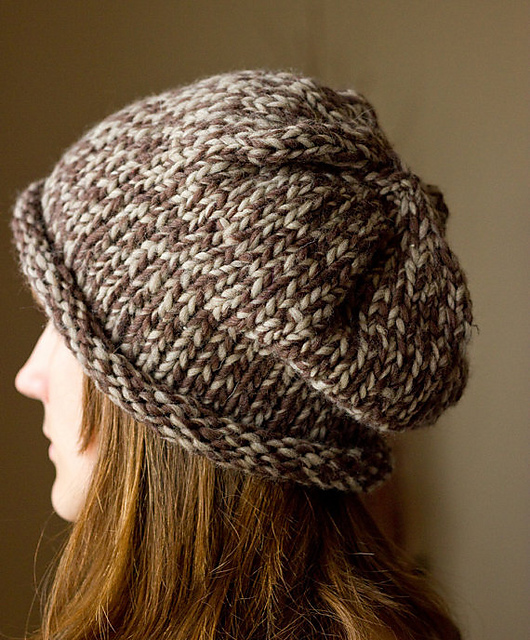 One ball of gorgeous yarn makes a hat – it’s a no-brainer holiday miracle gift! And yes, we sell fur pompoms (both real and synthetic) and excellent pompom makers! This entry was posted in Cascade Lana Grande, Cascade Spuntaneous, Free Patterns, gift projects, hats, Malabrigo Rasta, pompom, Uncategorized on November 29, 2017 by Knit-O-Matic. This pattern is one of our oldies but goodies, but sometimes you just need something fast and simple (actually, it’s one of the most popular freebies on our website). One skein of Malabrigo Rasta makes a pair of glorious mittens! This entry was posted in Free Patterns, gift projects, Malabrigo Rasta, mittens, Uncategorized on November 23, 2017 by Knit-O-Matic. Great one skein last minute gift! A client came in last week wearing a very simple toque (that’s Canadian for a winter hat) made with Malabrigo Rasta and I immediately thought “I’ve got to find a pattern for my other clients for that!”. This hat is styled with the brim turned up, but if you wear it turned down it becomes a perfect slouchy style hat. A bit Thank You to Halan for the inspiration! All the following yarn are suitable and ON SALE until January 8! This entry was posted in Cascade Magnum, Cascade Spuntaneous, Free Patterns, gift projects, hats, Malabrigo Rasta on December 22, 2016 by Knit-O-Matic.